Anna Palenchuk. Photo from personal archive. 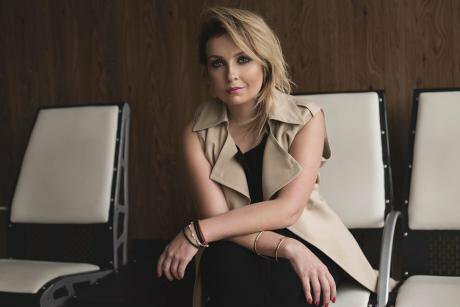 I speak to producer Anna Palenchuk about her production of Oleg Sentsov’s dystopian play “Numbers”. How did you come to start work on your film and stage production of Sentsov’s play “Numbers”? I’m in constant contact with Oleg through his lawyers, I support his family and I’ve published two of his books: “Buy This Book, It Is Funny” and “Stories”. I’ve been involved in his case since his arrest, and have tried to keep his name constantly in the news. He asked me to stage “Numbers”. That’s how it all started. When did he ask you to do this? Two years ago I learned from his sister that he had said “Palenchuk should do a production of the play”, but at the time it was too much for me to get my head round. But the Russian documentary theatre Teatr.doc and other theatres were doing readings of the play, and recently a Russian human rights campaigner told me that Oleg was upset that they were just readings and not an actual production. He wanted “Numbers” to be staged in a conventional theatre, to become part of the standard repertoire – it’s a very important work for him. 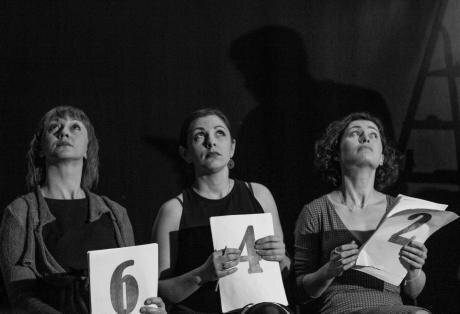 A reading of the play “Numbers” in Teatre.doc. Moscow, 2014. Photo: Andrey Kachalyan. The photo was provided by the producer Natalya Josef.I got hold of a copy of the play in 2015, before we published his stories. But since it wasn’t a published edition, it just lay on a shelf. However, after I realised that Putin wasn’t going to release him before the March 2018 presidential election – I had always hoped that he would be amnestied – I decided that I would stage it. I wrote to Oleg to tell him about this, and he gave me free rein with directing the production. But then I realised that he needed to be drawn into the process. Nobody knows what he is thinking about in prison, but if he were involved it would be something to keep him busy. How did Oleg react to the idea of getting involved in the production process? I had a response to my letter from him on 14 May, the very day he began his hunger strike (the letter was dated 12 May). In it, he described the stage set and costumes he wanted. He set out his ideas very clearly and I was really discouraged by the letter: on the one hand, he was announcing his hunger strike; on the other, it was formal work correspondence. I realised at that moment that Oleg wasn’t planning on taking his own life. The hunger strike had nothing to do with him being bored with being behind bars. His body is the only weapon that he has left. He has the right to do what he felt is necessary with it. I didn’t try to dissuade him, because I respect his opinion. Oleg has taken that decision, and I know that Oleg Sentsov can’t be dissuaded from anything. There’s going to be a film as well as a stage production? Back before Oleg started his hunger strike, I wrote to tell him that I was going to do a production of his play. I knew I couldn’t stage it on my own, so I set a time scale for doing it and found people to take part. My ambition is to create the most important cultural project of 2018. And since Oleg’s name is already in the news, it's audience will be a lot bigger than can fit into an auditorium. So I realised that we had to find a way of doing it that would reach the largest possible audience, and started to talk to Oleg about that. We came to the joint conclusion that we needed to shoot a film in the style of Lars von Trier’s 2003 film “Dogville”, containing elements of both stage and screen. It wouldn’t be pure cinema, but both Oleg and I, as producers, find it easier to think in cinematic terms. As he wrote to me: “You do what you like with the theatrical side of things, but I’ll look after the screen version.” Despite his hunger strike, Oleg sends me very clear, succinct messages. Tell us about your correspondence with Sentsov. How do you shoot a film and stage a play with a director who is in charge of the production, but isn’t physically present because he’s in prison? If I was working with other colleagues, it might not have been realistic. In the history of world cinema, there has never been a film directed by someone sitting in a prison cell. But we live in times when we need to be pioneers in a lot of things. It’s very difficult, but not impossible. 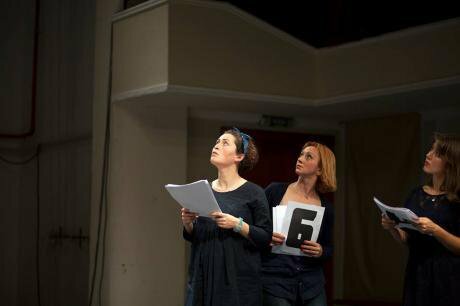 A reading of the play “Numbers” in the Center for Contemporary Art "Dah", Kyiv, 2015. Photo: Katerina Gornostay. The photo was provided by the producer Natalya Josef.The main thing is to get people who are creatively and mentally close to Oleg involved in the process. We’re choosing an artistic director who he has worked with him before, and our camera operator is also super-professional. There’s a great saying, that “in cinema, every small detail matters”. And with cinema, you’re never working on your own: it’s always a team effort. Oleg must be released, and he wants to direct his film when that happens. And in any case, our format lies somewhere between theatre and cinema: we need to confirm the stage set and costumes with Oleg, and only he can fine-tune the script. There’s a lot he can do remotely, and we can use his work as we move into pre-production and the shoot. How are you selecting your actors? Oleg tells me who he can see as which character. We can’t, unfortunately play him videos of potential cast members, but we take photos and show them to him. He has suggested a lot of people himself, including Viktor Andrienko, Rima Zyubina and Natalya Vasko. A reading of the play "Numbers" at the Ivan Franko Theater, Kyiv, 2015. In the role of "Sixth" – Rimma Zubina. Photo: Kira Kuznetsova. The photo was provided by the producer Natalya Josef.When we make suggestions to actors about taking part in Oleg’s story, they all say “yes”, but Oleg is giving me clear instructions about not using people who will empathise with him over his hunger strike. He tells me that I need to cast people who just like the material – that’s the most important thing. Rima Zyubina is one of the people who doesn’t only empathise, but acts as well. She also likes the material and has taken part in readings: she knows the play well. We also have Yevgeny Chernikov, an actor friend of Oleg’s from Simferopol, on board. We need to hold some more auditions, in any case. We have now also acquired Darius Jabłoński, head of the Polish Cinema Academy, as co-producer. Darius was involved in making “The Trial”, director Askold Kurov’s film about Oleg. Kurov is making enormous efforts to have Sentsov released. I spoke to him about it at the Cannes Festival in May and we’re going to do the post-production of our film in Poland. Is the Ukrainian state doing anything to help? We’ve just shown the scenario to the Ministry of Culture, as Ukraine has funds officially allocated for making patriotic films. But not all the experts accept our work as patriotic. When do you start shooting? We’re planning to shoot in November-December. A lot depends now on the availability of state funding. Will the film be launched in Ukraine? We’re hoping for worldwide distribution. Everyone empathises closely with Oleg and it’s important to have his work shown. For the international cinema world, it would seem ludicrous for a director to be overseeing a production from a prison cell. But the film and stage director Kirill Serebrennikov has been working on a film despite being under house arrest since August 2017 and the Iranian director Jafar Panahi continued to make films while under house arrest for several years. But Sentsov’s story should show the world his inner strength and how he is changing views of our country. His actions reveal his spiritual resilience. I thought that no one could survive such a long hunger strike, but evidently it is possible. His example is a sign that we can all do much more than we imagine. I keep thanking Oleg for showing me that: a year ago I never thought I would be able to work on a play and film simultaneously. Does your work on Oleg’s film help you not give up? I’m amazed at how I keep growing stronger and stronger. I can’t accept the fact that he is in prison. I’m so happy that the people who were involved at the start are still on board. We mustn’t ever relax. I don’t know if anyone can have any influence on Putin, but if we give up, we’ll lose this war. And we can’t lose it – the life of the impossibly talented director Oleg Sentsov is at stake.